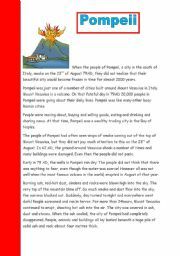 This is a comprehension on Pompeii- a city in Italy which was lost for nearly 2000 years. The children can read and discuss the text and then answer the questions that follow! 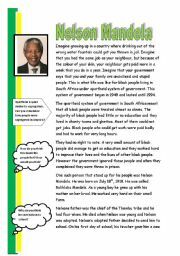 This is part 2 of my Mandela worksheet. 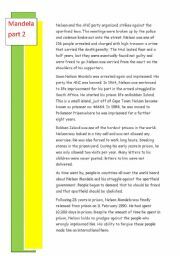 It deals with life in Robben Island and Mandela�s life after prison. Comprehension questions are included. Hope you like! This is a worksheet on the planets. 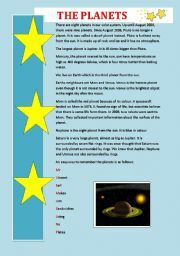 The children then have an oppertunity to write their own poem on the planets, answer some comprehension questions and there is scope at the end to start a discussion with the children about a visit to a far away planet. 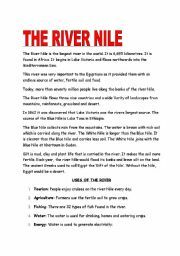 This is a very easy ws to compliment any work on the river nile. It has an easy reading sheet and comprehension questions follow. 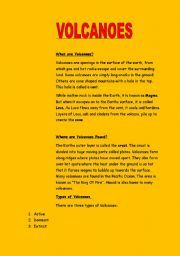 This is a comprehension on Volcanoes. It contains lots of reading and scope for discussion. Ten comprehension questions are included. I usually also get the children to make a volcanoe so as an extra you could talk about the materials that you would need, make the volcanoe and even do a mini project on the topic! A short powerpoint on adding ed to words and changing words to the past tense.